This plugin will monitor and control your Nest thermostat(s) and/or Protect smoke/CO detector(s) through your Vera home automation gateway. Monitor thermostat mode, fan mode, current and set point temperatures, humidity level, running states, battery level and “home/away” status. Control temperature set points, thermostat mode and fan mode. Set your house to Home or Away, switching all your Nest thermostats to an energy-saving mode when unoccupied. Monitor smoke/CO alarm status and battery level. 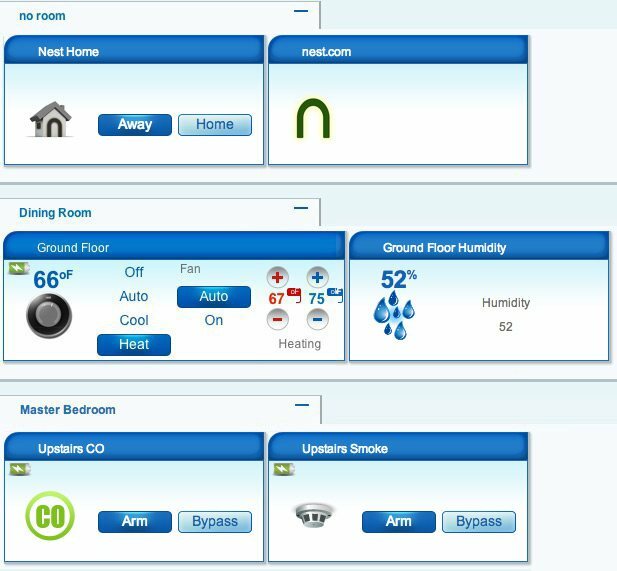 An example of the Nest devices shown in Vera (UI5). Open the settings for the Nest device that was created at plugin installation, and set your nest.com user name and password. Also choose a polling frequency (in seconds) if you want to poll more or less often than the default 120 seconds. You may not poll more often than every 60 seconds, as this might be considered abusive by the nest.com servers. The Nest thermostat internally reports very precise temperatures in Celsius, but by default the plugin will report whole number values (regardless of whether Fahrenheit or Celsius temperature scales are used). You can control this however, by specifying your preferred rounding precision with a device variable on the main Nest device called TemperatureScale. The value you provide is the denominator D in the fraction 1/D, the fractional value to which the temperature should be rounded. For example, providing 2 means that temperatures will be rounded to the nearest 1/2 (0.5) of a degree. Providing 10 would round to the nearest tenth (0.10) of a degree. The default value for TemperatureScale is 1, meaning only whole degrees are reported by default. This feature will not allow you to change the setpoint sliders in the user interface to fractional values; that is outside the scope of the plugin. Using this feature may cause unwanted side-effects that are outside the scope of the plugin’s control. Please test your configuration thoroughly before determining that a non-1 value is for you. This feature is agnostic to whether you display temperatures in Fahrenheit or Celsius, but it may be of more value to Celsius users to set TemperatureScale to 2 to achieve near-Fahrenheit granularity. I am presently only able to test the plugin against UI5 (1.5.622), but there are reports that it is working properly against the latest UI7 firmware. The plugin is based on an unsupported interface to Nest, which may break or otherwise become inaccessible at any time. The plugin stores your nest.com login credentials in plaintext in device variables which can be displayed clearly in UI5 and potentially other places. Updates to the state of the location, thermostat, humidistat, smoke and carbon monoxide detector devices can take up to the polling number of seconds (120 by default) to be reflected in the UPnP devices (or as quickly as 5 seconds). For the smoke/CO detector, BatteryLevel percentage is tied to a voltage range of 4200 to 5400 millivolts. Any actual millivoltage below 4200 is considered 0% and any millivoltage above 5400 is considered 100%. These numbers may change in the future, thereby altering the current percentage after the code change. The humidistat device currently only implements the humidity sensor service, but as the 2nd generation Nest thermostats can also control humidifers and dehumidifiers, this device type will be extended to implement new services. The source code repository and issue list can be located at https://github.com/watou/vera-nest. Please contact me through the micasaverde.com forum. All tips are gratefully accepted! futzle, garretwp, guessed, RichardTSchaefer and others on the forum for their kind assistance. hugheaves for his decompressScript shell script workaround for the problem with deploying compressed modules and for providing his open-source plugin for a different make/model thermostat. See about integrating historical energy usage data into the plugin. Have status updates arrive more quickly (if it turns out to be feasible). Report the heating or cooling stage, since Nest supports multiple heating and cooling stages. Implement Humidistat functionality to control humidity from Vera. Set the urn:micasaverde-com:serviceId:HaDevice1 variable LastUpdate for the location, thermostat and humidistat devices. For the location device, this is the Unix timestamp most recently retrieved from nest.com for that location’s status. For the thermostat and humidistat devices, LastUpdate (and BatteryDate) are the Unix timestamp from nest.com (also without any synchronization to the Vera’s clock) that indicates the last time the thermostat connected to nest.com. Decreased the potential for excessive status polling. Removed Clearing... log message from every poll and other log/debug cleanup. Removed the special case where heat and cool setpoints would show the same value. Fixed the plugin’s inability to set the thermostat mode to Off.